Magelica is no ordinary 12-year-old: she hatched from a blue egg, and has fairy blood, wild green hair and a set of wings. The girl has never met her parents and has been raised by a kind and loving woman named Gri. Her only companion is her pet dragon, Tris, and sometimes she feels a bit lonely. During a powerful storm, the warblegrif Odin bursts into Magelica’s house and whisks her away in a quest to save the Isle of Dreams. In this voyage, they will meet a powerful wizard, a giant turtle and a kind queen. But will Magelica be able to learn who she is and who her parents are? 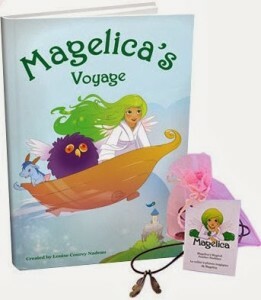 Magelica’s Voyage is a beautiful story for readers 4 to 11 years old. It has a powerful message for young girls: love is the key to happiness, and you can do anything if you believe in yourself. In fact, in the last few pages of the book, the author even gives the reader instructions on how to make their life magical. The book also includes beautiful and colorful illustrations that were created by Eugene, an artist who has worked on Disney animated movies. A pretty feather necklace comes with the book, and it brings positive energy to the person who wears it. In addition, the reader can find more information about the characters and the story on the Magelica’s Voyage website, along with a free coloring book and a free sticker book. Magelica was originally created as an eco friendly bath line for young girls when Louise Courey Nadeau was the Director of Marketing for Coty Cosmetics. It took 20 years for the book to be published. Magelica’s name is a combination of the words magic and angelic. Toys, clothing and other entertainment media are in the works to go with the book.